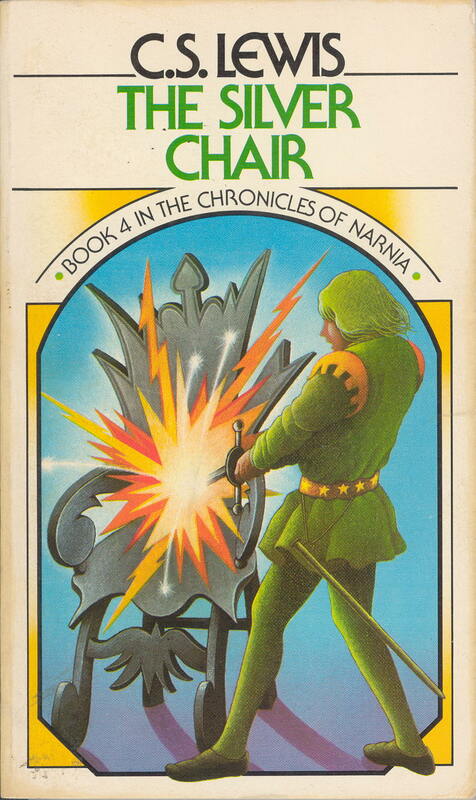 The Silver Chair by C.S. Lewis is perhaps my new favorite Narnia story. (Just remember that I say that after every Narnia story that I re-read.) I don't know how many times I've read this particular title personally, but it was my second time to read it aloud with the kids. It had more meaning for me this time around because a friend of mine is walking down a dark, hard road and it's been pressed upon me how important it is that we remember the truths of God's word, even when our eyes and minds are blurry and we're having a hard time focusing on Him. I wanted to read this story to the kids so that I could bring home the point to them that it's important to first memorize God's word and then always, always, always repeat those truths to yourself. In this way, I pray that even when my children find themselves in moments of doubt and disbelief, they will repeat the truths of scripture to themselves until they find themselves able to believe again. 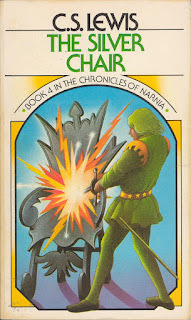 If you are unfamiliar with the story of The Silver Chair, it picks up where The Voyage of the Dawn Treader leaves off, at least in our world. Roughly fifty Narnian years have passed since Eustace was there. Eustace and one of his school chums, Jill, are whisked into Narnia where they are tasked with finding King Caspian's missing son, Prince Rilian. Aslan gives the children four signs which they are to repeat to themselves and obey in order to find the lost prince. The two children are also given a companion for the journey, a Narnian Marsh-wiggle named Puddleglum. This is the story of their adventures in finding Rilian. This is Jill's first visit to Narnia, of course, so everything about it is new and scary to her while Eustace has some amount of comfort due to familiarity. It is Jill who is given the signs by Aslan which she is to teach to both Eustace and Puddleglum. Right off the bat though she flubs the first sign. In fact, the children flub most of the signs which lead them on a series of misadventures which are both exciting and terrifying. In the end its Puddleglum who rises to the occasion, remembers the signs, and helps to make the mission a successful one. Jill and Eustace are still "rewarded" for their troubles, but some repentance is necessary as a result of forgetting and/or ignoring the instructions that Aslan had given them. The story ends triumphantly which is a joy and a comfort but there is sorrow along the way as the reader is forced to acknowledge "what might have been." Simultaneously, there is a relief in knowing that although we are prone to making big mistakes in life, Aslan can redeem each and every one of them and set all things to right. As I say, I loved this story and I found it incredibly relevant for life and godliness. Life is hard. Period. It is hard for different people in different ways but anyone who ever stands up and makes the bold claim to believe in Jesus Christ is in for hardship. If you expect you'll get away without a struggle then you are misinformed at best and delusional at worst. (Blunt? Yes.) Jesus said we're to take up our cross and follow him. Do we think this means down a tulip lined path? If so, we desperately need to rethink things because this life is designed to teach us to be holy as He is holy. Is life ALL hardship and pain? No, I believe not. There are glorious days of peace and joy which we become more and more grateful with over time and with age. There is great joy in the Christian life but there is also struggle. It's easy to want to embrace the one and not to embrace the other but as Job asked his dear wife, are we only to accept good from the Lord and not evil? If you said, "Yes" then you need to understand that that is foolish talk. Yes, I'm pressing a point here but I think its an important one. If we condition ourselves only to accept good from the Lord and not evil, then we're only willing to accept a god of our own making, a created being which we have defined to be "good" according to our pleasures and fancies. That's not a good god. That's a weak one who exists for our pleasure and our bidding. Life is hard, yes. But life is also full of JOY. During those moments it behooves us to camp out on the promises of God so that when the hard winds blow and the rain comes pouring down, we can "remember the signs" and repeat them to ourselves ad nauseum. And when we find our faith weak and we find ourselves struggling to believe in those promises? We repeat the signs to ourselves more loudly and pray, "Lord, help me in my unbelief!" Life, I think, is a battle to get to the higher ground again. Sometimes we enjoy so much peace it's hard to imagine that we shall ever meet a trouble. And then the trouble comes and it's hard to imagine that we ever were happy or that we can ever be happy again. Remember the signs. Repeat them. If God is not of our making, then we can trust His promises are true and that He will do all that He has said He will do. If He is not of our making then the journey is bearable. If we serve a god of our own making, then we are lost and there is no hope. Why? Because a created god can only be as strong as we are. This, we must acknowledge, is not very strong at all. Remember the signs. Repeat them to yourself when you wake up in the morning, as you go about your day, as you go to sleep at night. Camp on the promises - and commit to believing in them even when you don't want to. ". . . [Y]ou can play that fiddle till your fingers drop off, and you still won't make me forget Narnia; and the whole Overworld too. We'll never seen it again, I shouldn't wonder. You may have blotted it out and turned it dark like this, for all I know. Nothing more likely. But I know I was there once. I've seen the sky full of stars. I've seen the sun coming up out of the sea of a morning and sinking behind the mountains at night." He knew he was being subjected to trickery and he vocalized his beliefs at exactly the right moment. Maybe his present situation wasn't what he hoped for, but Puddleglum wouldn't forget, no sir and no ma'am! Maybe he was being buried in magic but he would hold fast to the truths he knew. The witch continues to sweetly argue against him and truth, trying to subdue both him and the children. She continues to taunt and tease the group, strumming her music and sitting serenely by her fire. Creating an atmosphere that looks and seems relaxing, she tries to lure the Narnians into submission. Finally Puddleglum's head becomes clear enough that he realizes that there is magic in the fire and he determines to put it out -- with his foot! He sacrifices his own true comfort to destroy the false comforts and show the witch for what she truly is. With the following speech he rallies his countrymen to cling to truth. "One word, Ma'am, he said, coming back from the fire; limping, because of the pain. "One word. All you've been saying is quite right, I shouldn't wonder. I'm a chap who always liked to know the worst and then put the best face I can on it. So I won't deny any of what you said. But there's one thing more to be said, even so. Suppose we have only dreamed, or made up, all those things - trees and grass and sun and moon and stars and Aslan himself. Suppose we have. Then all I can say is that, in that case, the made-up things seem a good deal more important than the real ones. Suppose this black pit of a kingdom of yours is the only world. Well, it strikes me as a pretty poor one. And that's the funny thing when you come to think of it. We're just babies making up a game, if you're right. But four babies playing a game can make a play-world which licks your real world hollow. That's why I'm going to stand by the play world. I'm on Aslan's side even if there isn't any Aslan to lead it. I'm going to live as like a Narnian as I can even if there isn't any Narnia. So, thanking you kindly for our supper, if these two gentleman and he young lady are ready, we're leaving your court at once and setting out in the dark to spend our lives looking for Overland. Not that our lives will be very long, I should think; but that's small loss if the world's as dull a place as you say." Maybe those who don't believe in the God of the Bible are right; maybe He is just a figment of our imagination, a crutch for hurting souls. But if my only choice is the God of Scripture or a world without Him, I'll take my chances. I might spend the whole of my life "hunting for Overworld" but I believe in its existence and I'd rather press on in that goal than wallow in the dark lands, wondering if anything can believed at all. All I know to pray is that when I next find myself "buried under the earth", looking for the promises of God to be true, I'll have a Puddleglum alongside me to lead me out of the witch's chambers and back into reality. Sometimes the grace of God looks suspiciously like a Marsh-wiggle; sometimes it smells like a burnt one. This story is a good reminder to all of us that until we reach "Overworld" we must be bold to encourage one another in faith, love, and good works. All of the above are the truths I want my kids to remember. These are the very things that will drive us back to scripture and back to Narnia time and time again. With all that said, I dedicate the following song to my Marsh-wiggle friends. I love you and I need you. I'm always amazed at Lewis's ability to express spiritual truth so vividly and accurately in stories.